Officially certified chronometer self-winding movement. Dual time zones, annual calendar. Paramagnetic blue Parachrom hairspring. High-performance Paraflex shock absorbers. 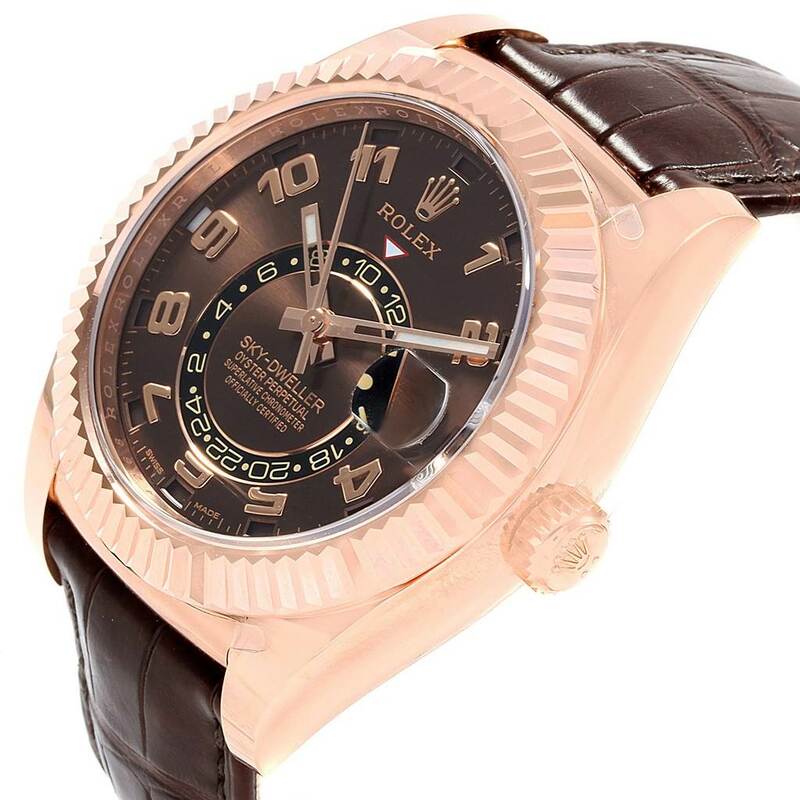 18K rose gold case 42.0 mm in diameter. 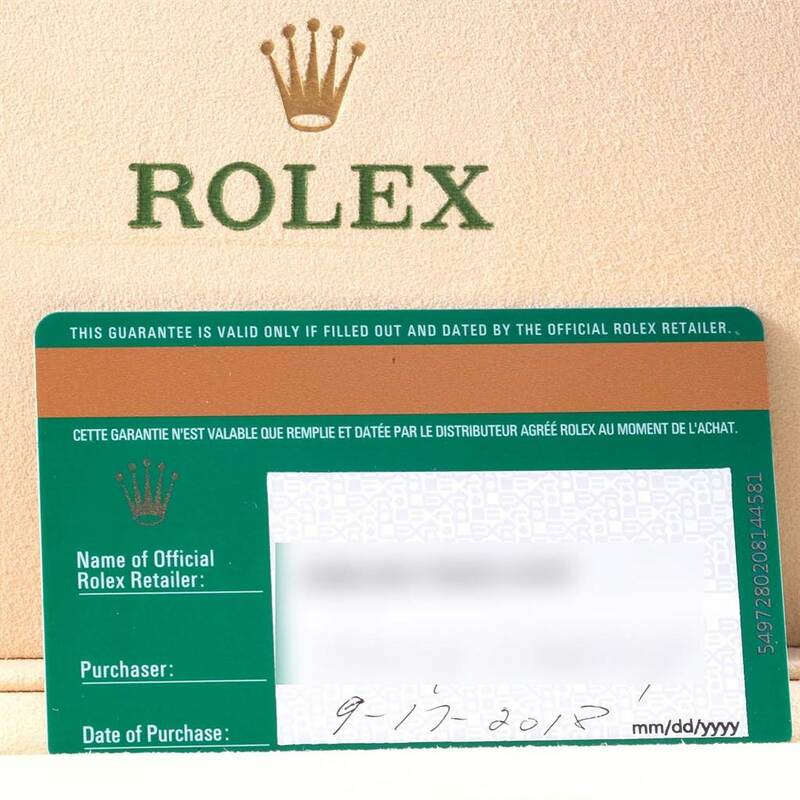 Rolex logo on a screw-down twinlock crown. 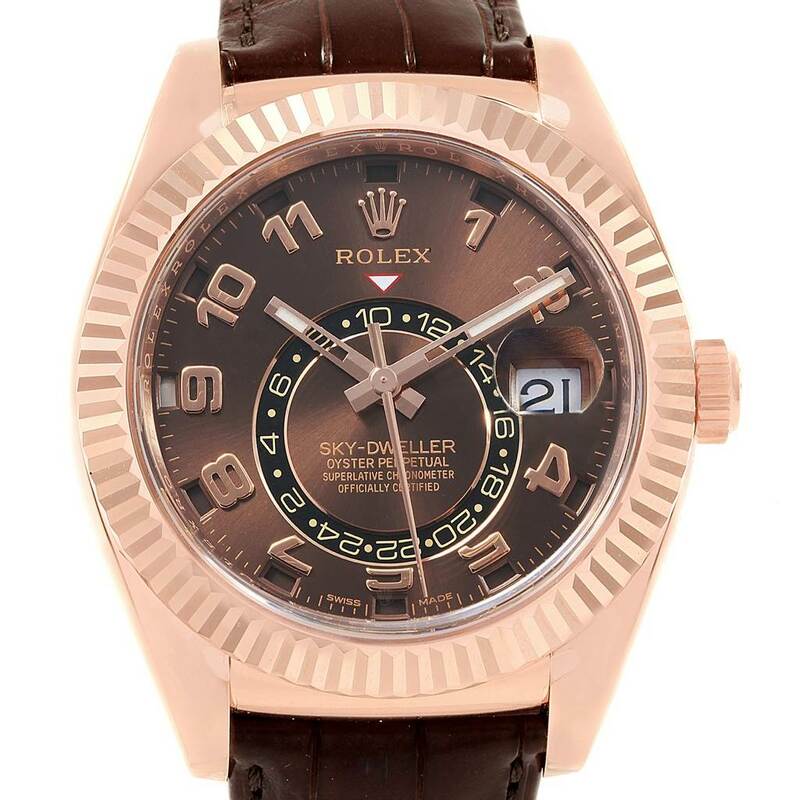 18K rose gold fluted rotatable ring command bezel. 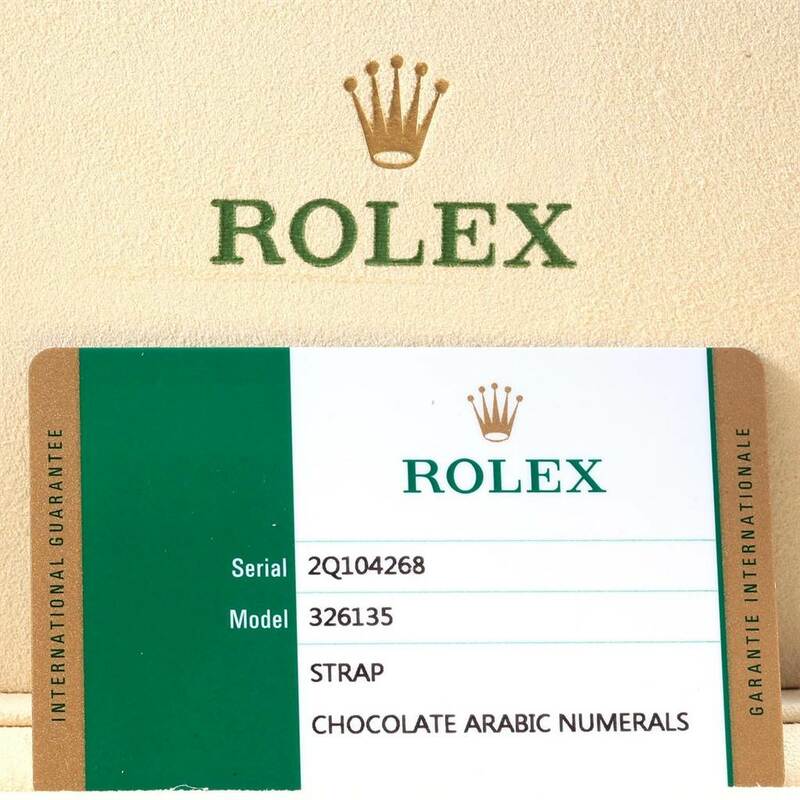 Chocolate brown dial with raised rose gold arabic numerals. Centre hour, minute and seconds hands. 24-hour display on off-centre disc. Second time zone. Instantaneous annual calendar at 3 o'clock and rapid-setting of the date. Month display via 12 apertures around the circumference of the dial. 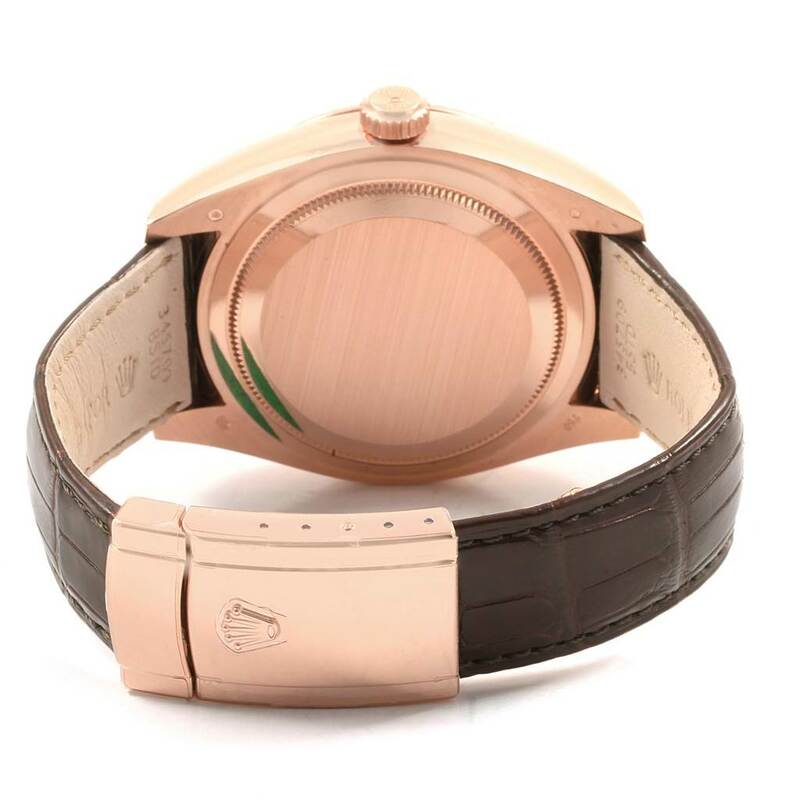 Brown crocodile strap with the 18K rose gold folding oysterclasp. 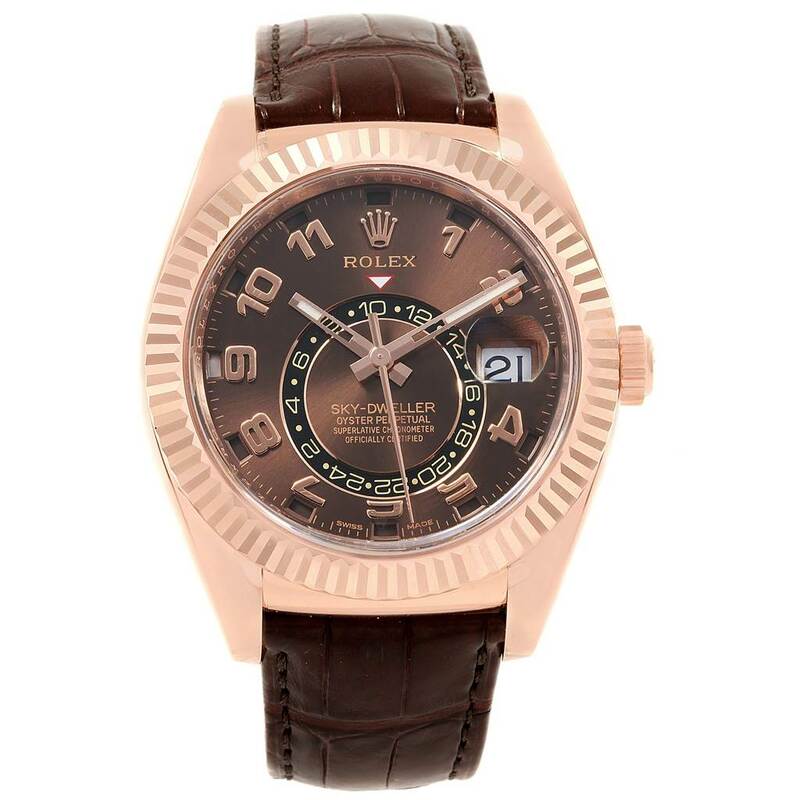 Rolex Sky-Dweller Chocolate Brown Everose Gold Mens Watch 326135 Unworn. Officially certified chronometer self-winding movement. Dual time zones, annual calendar. Paramagnetic blue Parachrom hairspring. High-performance Paraflex shock absorbers. 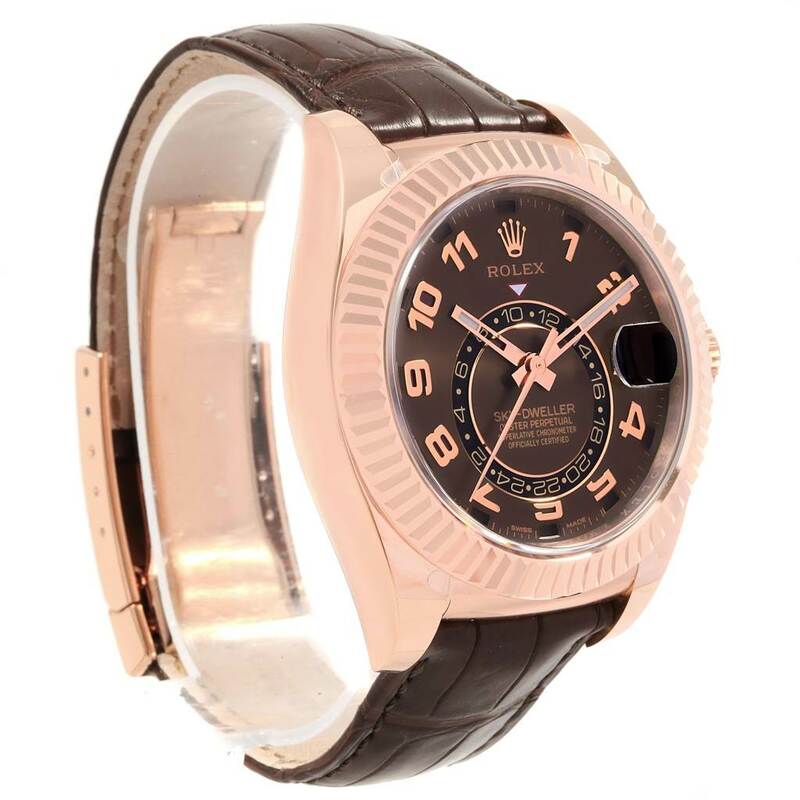 18K rose gold case 42.0 mm in diameter. 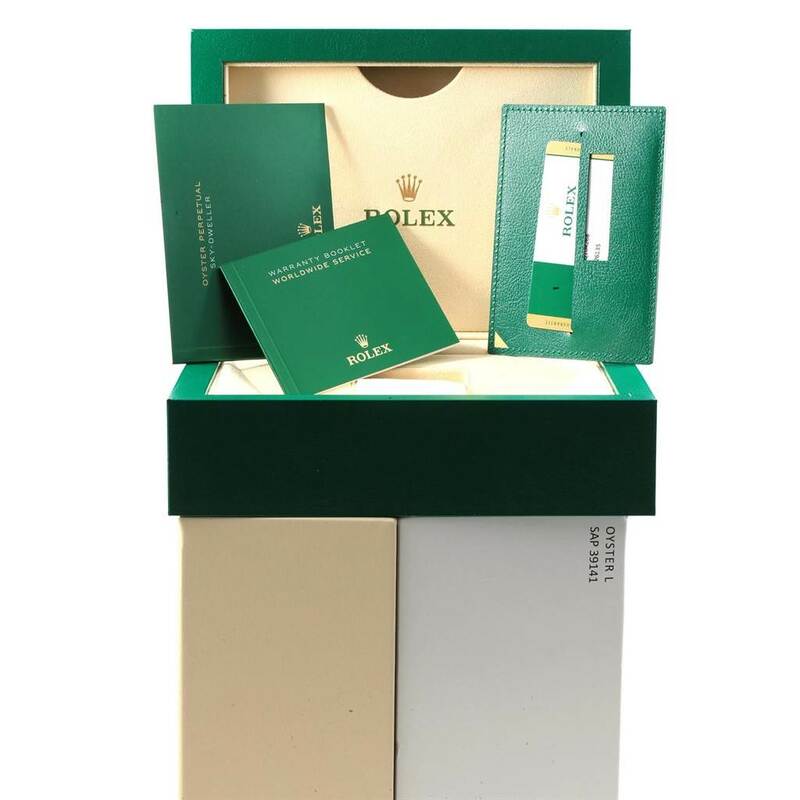 Rolex logo on a screw-down twinlock crown. 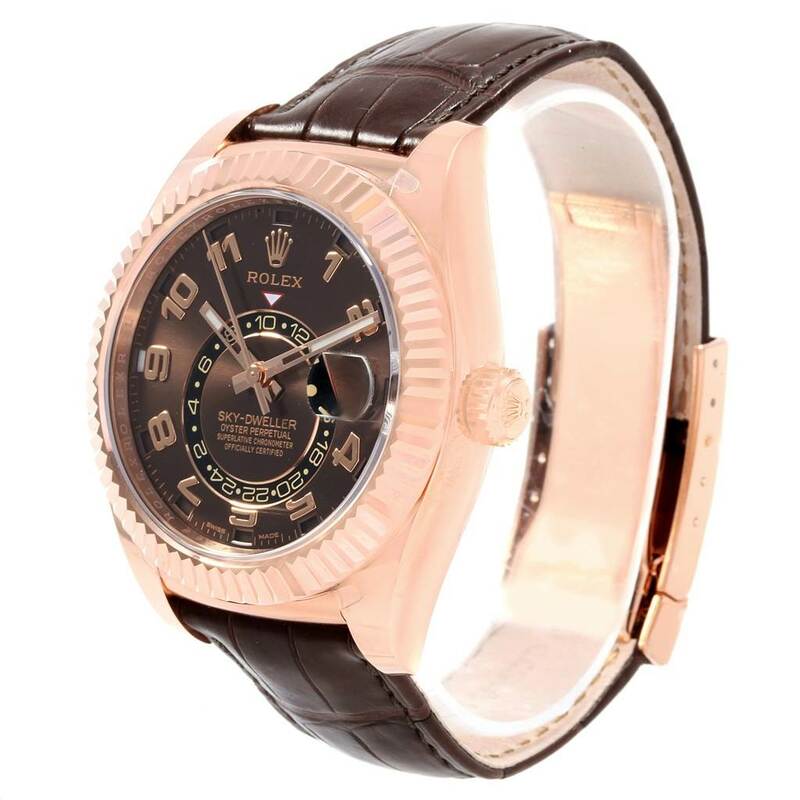 18K rose gold fluted rotatable ring command bezel. Scratch resistant sapphire crystal with cyclops magnifier. 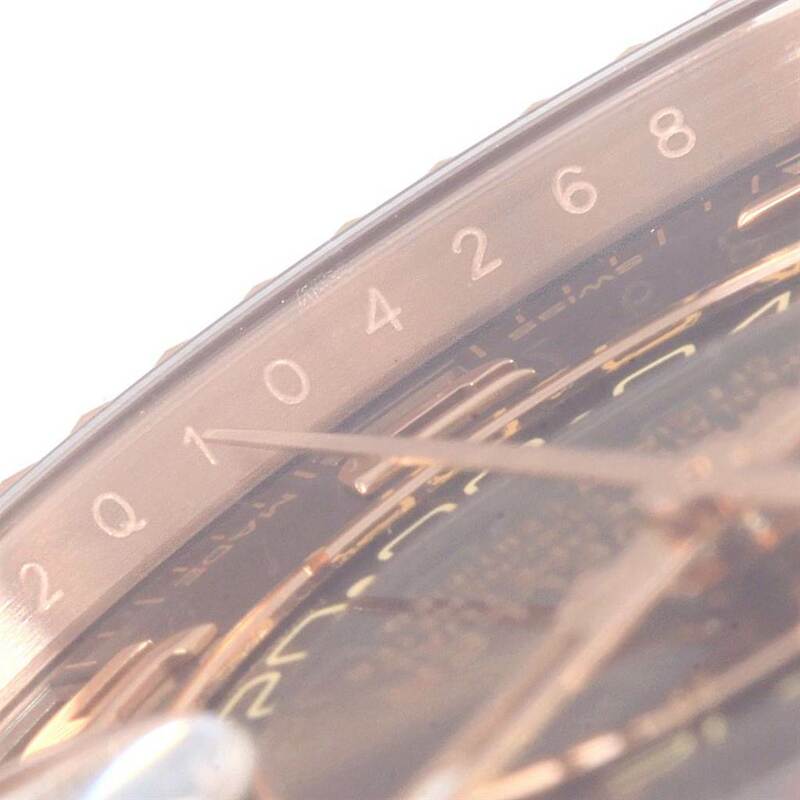 Chocolate brown dial with raised rose gold arabic numerals. Centre hour, minute and seconds hands. 24-hour display on off-centre disc. Second time zone. Instantaneous annual calendar at 3 o'clock and rapid-setting of the date. Month display via 12 apertures around the circumference of the dial. 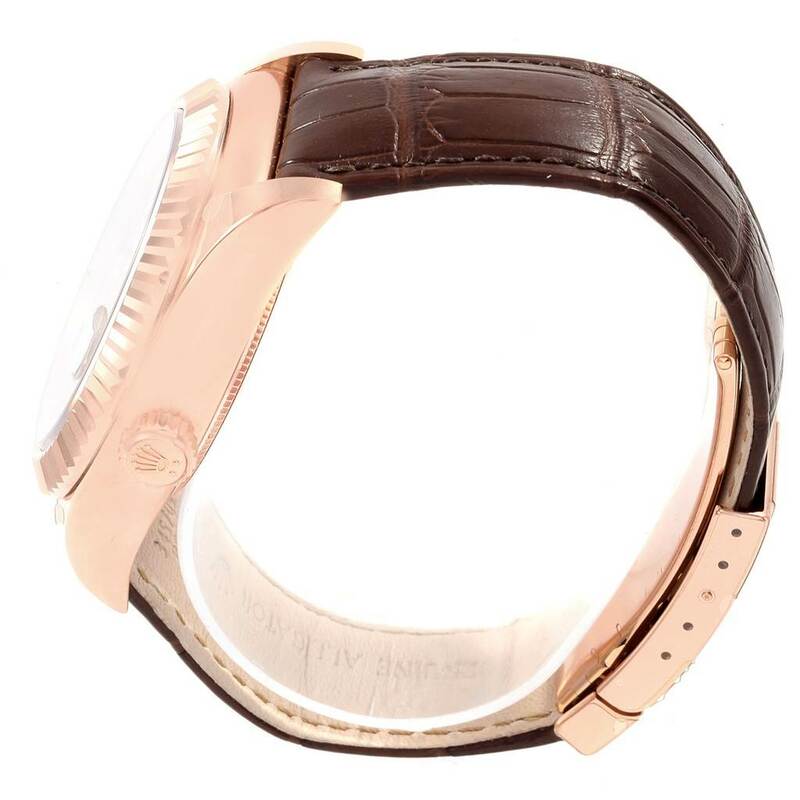 Brown crocodile strap with the 18K rose gold folding oysterclasp.